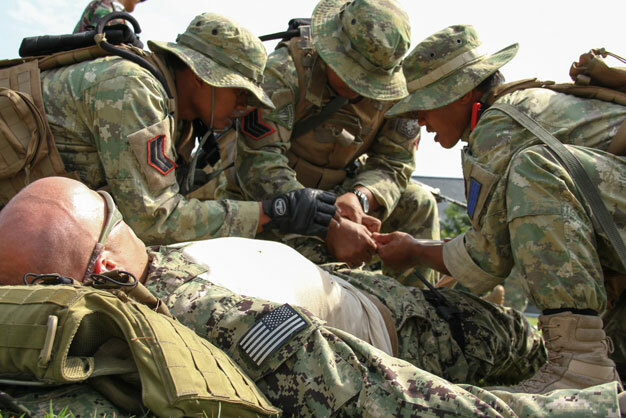 US Navy Sailors assigned to Riverine Squadron (RIVRON) 1 participate in Tactical Combat Casualty Care training with Indonesian Navy Kopaska commandos during Cooperation Afloat Readiness and Training (CARAT) Indonesia 2012. CARAT 2012 is a nine-country, bilateral exercise between the United States and Bangladesh, Brunei, Cambodia, Indonesia, Malaysia, Singapore, the Philippines, Thailand, and Timor Leste and is designed to enhance maritime security skills and operational cohesiveness among participating forces. US Navy photo by Lt. Fernando Rivero.